BA+JP Mobile Kiosk is On the Move! 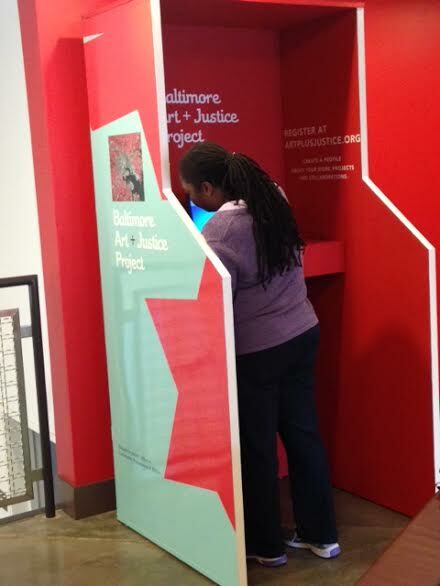 The Baltimore + Justice Project has designed a mobile kiosk to take our online map on the road. With summer quickly approaching, we want to let you know when it will be in your neighborhood so you can get yourself, your friends and fellow artists on the map! Our first stop is the City Arts Apartments, 440 E. Oliver Street, in the 2nd Fl lounge. If you live in the City Arts Apartments, take five minutes out of your day, and let Baltimore know about the great work you are doing to keep our city vibrant! We should be there until the end of May so sign up as soon as you can! Oh yeah, it feels like walking into a 1980’s video-game…who doesn’t want that experience?